Window World of Savannah is proud to offer the most advanced siding on the market, the Prodigy® Insulated Wall System. Each Prodigy® profile has a way of serving your residence, and giving you the most for your money. Contact Window World of Savannah to schedule your free in-home estimate! We’ll send a seasoned siding professional out to your Georgia home to discuss with you the best option in coordination with your style and budget. If you want to reduce energy costs, protect your home in a blanket of insulation, and upgrade your Georgia home’s exterior with an amazingly beautiful exterior cladding, then we’d like to introduce you to the Prodigy® Insulated Wall System. Each Prodigy profile (Single 7, D6 Clapboard, D5 Dutch lap) offers unique benefits to lower your energy costs. And, during your free in-home demonstration, one of our certified home improvement specialists will help you decide which vinyl siding type is best suited for your lifestyle. The Prodigy® Insulated Wall System is the most advanced vinyl siding on the market. Boasting the thickest EPS foam insulation on the market – up to 1-1/2” thick, Prodigy provides increased insulation value to help reduce energy costs in your home. The exterior surface provides the rigid feel, course lines, and beautiful appearance of a real wood product. And for added peace of mind, the durability of Window World of Savannah’s Prodigy® Insulated Wall Vinyl Siding System will protect your home against the elements now, and for years to come. Thick contoured insulating underlayment ensures that this series of siding will wrap your home in a blanket of protection. Incredibly strong due to it’s locking design, the 4000 reinforced vinyl siding has been tested against hurricane-force winds and prevailed. The 2000 vinyl siding is easy to maintain and will save you time and money on regular upkeeps. Your exterior will appear straight and smooth thanks to the rigidity and locking design. If you desire a classic, wood appearance, look no further than the 1500 series of Window World vinyl siding. Created with a custom wood appearance that won’t chip, crack or blister, this option never stops working for you. Blending affordability and value, the 1000 vinyl siding series is designed to give you the most for your money. Its rolled-top nailing hem protects your Savannah home from the elements, even on the hottest or coldest of days. 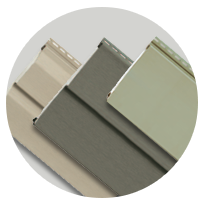 With the ability to customize the look, style and color of your siding, personalization has never been easier. All of our siding products are backed by a lifetime, limited transferrable warranty to give you peace of mind.